Indraprastha University CET is the exam aspirants take up, to get admission into the Guru Gobind Singh Indraprastha University. 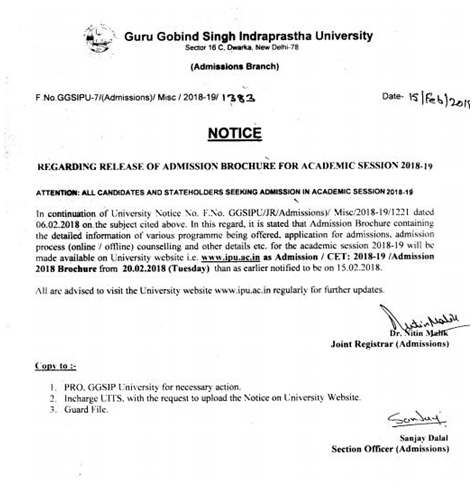 Candidates can get admission into the GGSIPU for various branches of engineering such as Computer Science, Civil Engineering etc. They can choose the branches according to their interest for a full time 4 year BTech course. The students are picked up on the basis of their scores in the exam and the ranks achieved by them. This test is a pen-paper based test. The only method to apply for the examination is through online mode, you’ll have to visit the official website after the notification is released and fill up the online application form to get registered for the CET. The candidates get 2 hours 30 minutes for BTech course CET and 3 hours complete for BTech with the branch of Bio-Technology. Physics- This section tests your Physics knowledge along with problem-solving ability. It covers 19 topics of physics from class 11th and class 12th syllabus and any number of questions from each topic can be given for the CET test. Total marks for the section will be 200. Chemistry- This section tests your Chemistry knowledge and the topics are covered from the syllabus of class 11th as well as class 12th which totals to 23 topics. Total marks for this section will be 200. Maths- This section tests your Mathematics skills and problem-solving ability for the topics of class 11th and class 12th. Total marks for this section is 200. All the sections as applicable above except maths. Biology- Instead of maths, candidates have to answer the biology questions to give a proof of their biology knowledge and this section will contain the questions from class 11th and class 12th biology subject. Negative marking is also applicable and you’ll lose 1 mark if you answer is wrong. 4 marks will be given for all the correct answers you mark. All the questions asked in various sections will be of the Multiple Option type, where the candidate has to choose one correct answer from the choice of four answers provided and mark the same on the OMR Sheet. The most important thing to see before undergoing any test is to check the eligibility, and apply only if you find yourself eligible for the test. The interested candidates are required to pass class XII or any equivalent exam from a recognized board with the minimum aggregate of 55% in Math, Physics, Chemistry (PCM), Biology (for biotech) subjects. The candidate has to pass a compulsory exam in English as well. Those who are appearing in class XII exams can also apply if they meet the eligibility criteria after declaration of result. Such candidates would have to show class XII mark-sheet as well along with other required documents. A relaxation of 5% marks is given for the students from various categories such as SC, ST, OBC, DEFENCE. The application form of IPU CET 2018 will tentatively be available from first week of March and it’ll be open till the dates mentioned below. Correct CET Code should be entered: for example, CET Code for B.Tech and B.Tech (Biotechnology) are different. Correct information must be filled in the IPU CET 2018 application form and the prescribed format should be followed. Candidates must enter their name in capital letters as displayed in Class X or equivalent certificate. If failed to do so, it can result in the cancellation of the candidature of that particular candidate. Photograph, Signature, Left Thumb Impression: The maximum file size allowed for upload is 80 kb and the file format should be JPEG. Candidates can use the website for filling the online application forms when available. After the submission of the above details, login credentials will be generated, using which candidates can login to fill the course details, and choice of exam centre.You can re-verify before the final submission of the filled form and so your online form is submitted successfully. The exam fee for the IPU CET is ₹1000. Offline Mode- Pay at any branch of State Bank of India after generating the challan. 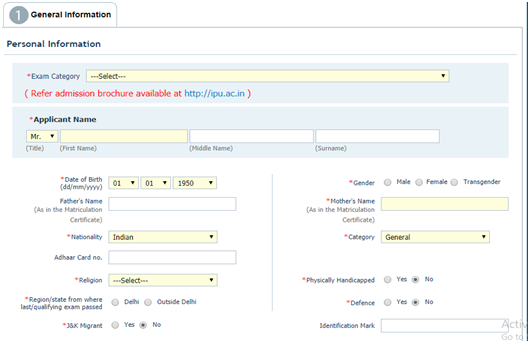 Candidates will need to enter the login credentials to download the admit card. They have to carry two copies of the admit card in which one copy will be handed over to the invigilator in your respective rooms. Candidates can login to the official website for downloading the admit cards. Results are announced on the official website under the NEWS section, from where candidates will be redirected to the result page where they have to enter their roll no. along with the date of birth. The result includes Total Marks obtained and the Rank obtained according to Merit. Candidates can login to the website for the exam related brochures and advertisements. After the results are out, candidates can log-on to the above website and apply for the counselling. First counselling consists of Choice entry followed by admissions. 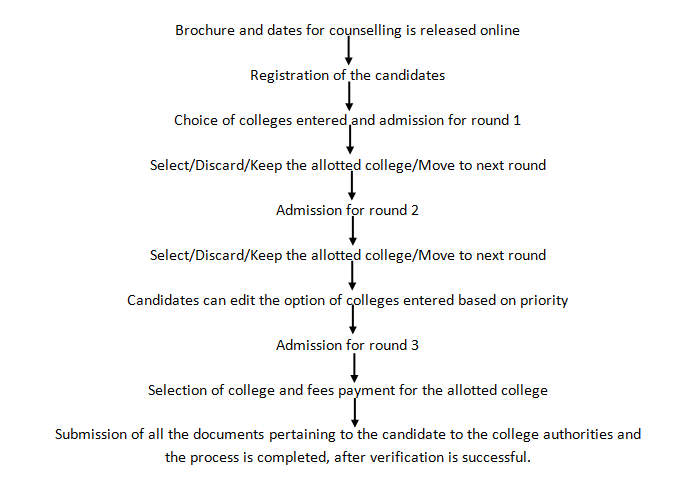 A candidate can even choose to go for further counselling to get a seat in a better available college according to their preference and choices are given. Once the seat is finalised, cut offs are released and the candidates can go for the allotted colleges for admissions and document verification. A notification informing the release of the admissions brochure for IPU CET 2018 was published on the official website of IPCET on February 15th, 2018. The notification states that the brochure for the academic year 2018 – 2019 will be put up on 20th February. While there aren’t any official dates that have been announced for the examination, it will most likely be held on May 13th, 2018. The IPUCET 2018 syllabus depends on the type of program being opted for. Candidates applying for B.Tech have to be familiar with Plus Two CBSE level Mathematics, Physics, Chemistry, and Logical Reasoning. For M.Tech the syllabus is the same as that for GATE. Given below are the important dates for candidates applying in IPUCET 2018. A detailed list of all exam centers will be published on the official website along with the admission brochure on 20th February. Results of IPUCET 2018 will be published on their official website. Candidates can check their final score by logging into the result portal of the site using their login credentials. Cut-off mark is the minimum score required by a candidate in order to be considered for counselling. These marks determine the candidate’s admission into various institutions. The cut off marks depends on several factors including the type of course being enrolled for, number of candidates, etc. The question pattern might be different for each exam but the marking scheme is identical. During the year 2017, 54,500 candidates appeared for IPUCET 2017 and Nishant Sanjay Kumar was the topper was for the UG course. The validity of IPUCET score card is 1 year from the announcement of results. This means that candidates have a year to secure admissions into the desired colleges before losing the validity of the score card. According to IPU, relaxation is offered for candidates belonging to Scheduled Castes, Scheduled Tribes, Widows or Wards of Defense Personnel, and Persons with disability, who will be allowed a 5% relaxation of marks in the minimum eligibility requirement. Seat allotment and counselling will be done by the responsible authorities online. Candidates will have to register themselves and fill their preferred choices. Unregistered candidates will be neglected from the allotment processes. Seat allotment is usually conducted in three rounds, and based on merit and preferences, candidates will be allotted to various universities. *As the dates for the current year have not been released the above dates are tentative. They have been provided as per previous years patter. Dates will be updated as soon as they are released.